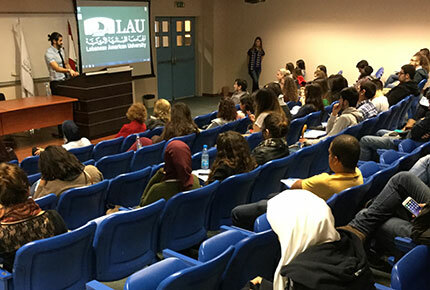 Masculinities specialist Anthony Kaadi spoke to students in Beirut and Byblos as part of the monthly talk series organized by the Institute for Women’s Studies. Masculinities specialist Anthony Kaadi spoke to two rooms full of LAU students last week about feminism, social conditioning and patriarchy during this month’s edition of Food4Thought, a series of informal talks organized and presented by the Institute for Women’s Studies in the Arab World. As usual, the first talk, on Wednesday, was held with students on the Beirut campus while another took place the following day in Byblos. “Be a man! Man up! Take it like a man! What do these phrases mean? What do they demand of you?” Kaadi asked the audience of male and female students. The responses he got, which predictably distinguished the behavioral norms and traits society expected of men and women, led him to explain. “Men are conditioned from a very young age not to cry, to be leaders, to tackle problems not through discussion but through violence,” said Kaadi, who himself recalls bottling up his emotions as a young man. While women have also for generations been conditioned under a patriarchal hierarchy, the international feminist movement went some way to counter women’s suggestibility and promote more freedom of choice for women, he added. Kaadi, who has worked with ABAAD Resource Center for Gender Equality since its inception in 2011, and has often collaborated with the Women’s Institute, went on to describe the changes brought about by the feminist movement. “Feminism created female leaders, chipped away at discrimination based on power relations and empowered women to hold on to feminine qualities while gaining the freedom to embody traditionally male traits, but the same was not done for men.” This in part might explain why men, who are raised to view vulnerability as a weakness, die younger from stress-related substance abuse and cardiovascular disease. This month’s Food4Thought talk was part of a series of initiatives being held as part of the global campaign “16 Days of Activism Against Gender-Based Violence.” Upcoming events as part of the same campaign include a film screening and panel discussion on December 7 (http://iwsaw.lau.edu.lb/activities/event.php?evt=20151207_screening-and-panel-discussion-i) and an interactive theatric performance on December 10 (http://iwsaw.lau.edu.lb/activities/event.php?evt=20151210_interactive-theatre-politics-is-).